I got Google Wave invitation and after that I have spent few hours in few days. When I first logged-in I thought there will be lots of good stuff to watch, but nothing was there. Then I have logged-in using my test account given with the main account. I started chatting with myself using both account. Chatting with self. Not funny? Ok. but it was a test. It was working. After that I could not find anything for long. I tested every links. I logged out. Next day I could not find the time, so no testing. Again next day I logged in thinking now I will get something. But no luck. Nothing was there. I logged out. Not a joke. It is true. Now today, I have found something. I saw a link - 'debug'. There some links are there. You see I have added a chess board. That also comes from debug link. funny! Why it is there? It seems, all need to learn how to use Google Wave! Right now, I only want to see how to develop application there and widget for websites. I have a blog, so I may use it. also, I thought of developing an application there. 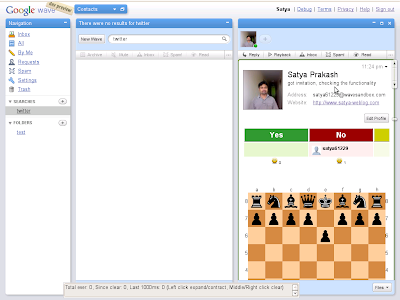 If you have good links which tell in short how to develop an application in Google wave then please give me. I know Mashable has good tutorials on Google Wave. but i guess it can used for other purposes too. If you’re looking for a free solution you should check it out. I got Google Wave a few days ago and felt quite lost at the beginning. A friend showed me a new website yesterday, it looks very promising, there are already a few well-done and funny tutorials online. Happy waving and thank you for your feedbacks on Wave! thank you for the link. Indeed it looks great. I know know how to have a profile on wave, exciting! Thank you also because I got to discover Google Mystery, or shall I say now, Mystery Seeker as it happens it changed its name. Great fun as well and I like the mission part too. Just figure you deserved a big up for posting this great link, again, thanks!! !